"OK, Hixson. Zorn's hurt and out for the rest of the game. You're our man--now go out there and get 7!" "Coach, you can count on me... Guys, its a 32 Up and Out. Largent, I'll be looking for you at the five. Break!" A wild fantasy from the deranged mind of a short, slow, and (slightly) overweight sports nut? Not entirely not with my Atari 800 and Cypher Bowl, an excellent two-player football game program by Bill Depew. Now we would-be jocks can step into the electronic shoes of a Jim Zorn, a Walter Payton, or a Jack Lambert to live our fondest fantasies in perfect safety. No injuries, unless you count acute "controller thumb," a malady now surpassing tennis elbow in popularity. Cypher Bowl is attractively packaged in a sturdy, colorfully illustrated box. Both cassette and diskette versions are included (they are the same). The documentation is very good. The user manual explains the game clearly and gives good tips on playing techniques. Two playcards are included, laminated in plastic to withstand a lot of handling. Each playcard includes the offensive and defensive formations and plays. Sketches of each play show the patterns that the receivers, blockers, and defenders will run. Once you have read the instructions and studied the plays, the game can begin. The program is self-booting and no cartridge is needed. The opening display is of the title, manufacturer, copyright notice, and a portion of the field. The crowd roars, and you're ready to go! Pressing any key turns on the standard display. In the center of the screen are the field and the two five-man teams. You have a blimp's-eye view of the field, which runs vertically on the screen. The view is always centered on the ball. About 30 yards of the field are visible. The score, quarter, and time remaining are displayed on the top of the screen. On the bottom are the down, yards to go, and the time-outs remaining. The game is played in four simulated 8-minute quarters. There is no kick-off. The blue team starts with the ball on their 20-yard line, with the white team defending the top of the screen. Each player begins by selecting one of four formations from the playcards. On offense, you can spread your receivers, or play them in tight. The defense can put everyone up front, or drop up to three players back to play pass defense. After both have chosen, the teams move into position. The players scrutinize each other's calls, then pick one of four possible plays allowed for the particular formation. Offensive possibilities range from quick openers to the bomb. The defense can opt for a strong pass, strong run, or balanced defense. What you choose depends on the formation your opponent unveils. For example, if you call a defense strong against the run and the offense deploys in a spread formation, you can still make the best of it by calling a zone defense to protect against the probable pass. However, your chances are poorer than if you had elected a strong pass defense formation to begin with. This method of play calling is well thought out and superior to the other games I have played. Both players have options after they see the other's call, instead of the defense only. Another nice touch is the way Cypher Bowl handles the 30-second clock. There is no delay of game penalty, but the clock is automatically stopped after 30 seconds until the play commences. The Cypher Bowl clock also stops between quarters, for the two-minute warning, for time-outs called by the players, and on incomplete passes and out of bounds plays. After selection is complete, play is initiated as the offensive player moves the joystick. Instantly, the scoreboard information disappears and your view of the field increases to fifty yards. This is especially nice on pass plays, as the receivers would soon run out of view otherwise. During play, the offensive player controls the quarterback or the receiver, whichever has the ball. As the manual points out, it is easier if you visualize yourself as controlling the ball, with the player coming along for the ride. On defense, you control the middle linebacker. The remaining eight players are controlled by the computer, following the patterns shown on the playcard. Think about that for a moment. A total often players, moving in individual patterns. How? Aren't there only four players in Atari Player/Missile graphics? Yes, but Cypher Bowl shows just what a good programmer can do with this system. In order to get more than four players, single players are moved to different screen locations between TV frames, every 1/60 second. The images alternate so fast that the eye can't discern the change, except for some minor flickering. As a result of the individual control of each player, blocking, passing, and pass coverage patterns are exceptionally realistic. If you make the right call, your left end will take the right linebacker out of the play and leave a hole a truck could drive through. However, if your opponent outguesses you and fills that area, you will be lucky to get back to the line of scrimmage. Cypher Bowl excels in its simulation of the passing game. This was also the hardest part of the game to learn. Not only do you have control of passing direction, you must also control distance. In the other games I have played, a thrown ball will travel indefinitely, until it hits a receiver or defender, or goes out of bounds. Any eligible receiver (offense or defense) in the path of the ball will catch it, whether 6 or 60 yards from the quarterback. Cypher Bowl adds a third dimension--height of the ball above the ground. Now you can throw the ball over the head of the defender. Of course, this also enables you to overthrow your own man, which I have been able to do very consistently. A pass is launched by pressing the joystick button and pushing the stick toward the target. The distance is determined by how long you hold the button down. The height of the ball cannot be shown on the screen, so sound is used. A rising tone indicates a rising ball, and vice-versa. Once thrown, you can control the direction of flight with the joystick to "fine tune" it to the receiver. I think that this is one weak point of the program. The ball is too controllable. You can start it toward one sideline and then steer it clear across the field, or even reverse it back toward the quarterback. The magnitude of control should be reduced to a little nudging. Another superior feature of Cypher Bowl is the option to throw to either of two receivers on most plays. You also have some control of the receivers on pass plays. Once the ball starts its downward flight, pressing the joystick button causes the receivers to break off their patterns and move back toward the ball. As you can imagine, orchestrating all this activity in the period of about two seconds requires a lot of practice, but what a feeling when you float the ball over an onrushing linebacker to the tight end cutting back in front of the safety. A caution--there is only a five to seven yard window in which the receiver can catch the ball. If you overthrow, the defender is likely to get it. You might think all this control would make an accomplished player unstoppable. Not so! This game provides a few tricks for the defense as well. If your defensive linemen get within a few yards of the quarterback before he throws, the ball will be batted down. Once the ball is in the air, you can make your defensive backs cut toward it by pressing the joystick button. All in all, the offensive/ defensive balance is good. The kicking game is good. The ball is kicked by pressing the button. Instead of going a random distance, the longer you wait before you press the button, the farther the ball will go. A split second too long, though, and it will be blocked. There is no difference between a field goal and a punt. If the ball goes between the uprights, it's worth 3 points. I have played Cypher Bowl for over 30 hours now, and the more I play, the more I like it. The realism is a step above the other games I have played. The graphics, in spite of the lack of detail, are quite good. Player/Missile graphics, fine scrolling, and mixed modes are used very effectively. The animation is both smooth and fast. The playability is good, and it's not an easy game to master. I'm still below 50% in the passing game, but I'm getting better. I think it is this continuing challenge in any game that keeps you playing it, along with the fun. In summary, this is a worthwhile game. If you're a "stats junkie," it probably won't be your cup of tea, but if you like a sports game that makes you think and participate, I believe you'll love this one. Don't be confused by the pun. The Antic that everyone associates with Atari computers is the support chip that makes possible the superb graphics needed for all of those neat arcade-type games. The Antiks in the title of this product refers to the insect you need in order to have a picnic. When the two get together, you wind up with a neat arcade-type game with great graphics, and everyone has a picnic. 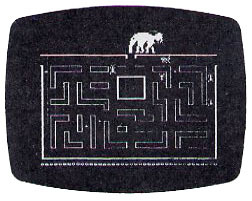 Krazy Antiks is the fourth game cartridge released for the Atari 400/800 computers, and it bucks the trend of "me-too" arcade-style games. Lately it seems that everyone is trying to cash in on the arcade craze by serving the warmed-over remains to computer owners. Even K-Byte's earlier ventures into game programming tended to follow the heavily beaten path. But Antiks has just enough of a twist to be considered a new idea in a market saturated with retreads. I must concede that the locale of the action is nothing novel--the ant hill in question strongly resembles the type of maze used in any number of games spawned by that prolific procreator, Pac-Man. But the scenario is a fresh one. You play the role of the White Ant, and your purpose is one familiar to students of biology--to perpetuate the species. You start the game with about 30 eggs, which represent your capacity to reproduce, at the bottom of the screen. Arrayed against you are several adversaries. First, one ant each of the four basic ant types yellow, blue, green, and red-circulate around the maze, trying to devour you. Another natural enemy is the dreaded anteater, who strolls into the picture every so often and sticks his tongue into the anthill, sucking up friend and foe, ant and egg alike. Finally, periodically a rain shower turns the lower part of the anthill into a disaster area, minus the federal aid. With the odds against her, the lone ant has little chance for survival. Fortunately, if she can find a safe place in the maze in which to lay an egg where it will not be eaten by another ant, after she is gone, the egg will hatch, and another white ant will take her place. Moreover, she has a weapon she can use. The other ants are busy laying eggs also, and when she eats one of theirs, she begins to glow, letting you know that the next egg she lays will be deadly to the other ants, if laid directly in their path. At each level, play continues until the white ant is killed, without leaving any eggs in the maze, or until all four of the other ants have been killed without surviving offspring. If the latter occurs, the game proceeds to the next level, and four new enemy ants come marching in to the tune of "When Johnny comes Marching Home" (which some like to think of as "The Ants Go Marching Two by Two"). Each maze has 99 levels of difficulty. If that fails to provide enough variation, there are six different maze configurations to try out. Wayne E. Hixson, 115 NW 39th Street, Seattle, WA 98107.